The photograph shows a few of the Lay Stewards in the Nave of St George’s Chapel one Garter Day shortly before the doors were opened to admit the congregation to the Service of Thanksgiving. 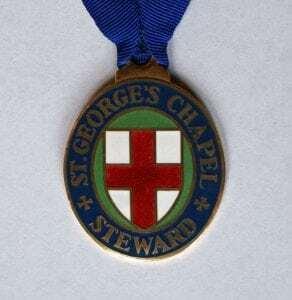 In 1966 Dean Robin Woods set up the Lay Stewards ‘to serve the needs of St George’s’. Prior to that time volunteer lay members of the community had served as requested on a very ad hoc basis. Robin Woods’ plan was to invite about twenty men to form a new body to be present at some services and events. Three of those upon whom he called and who later became Captain of the Lay Stewards were men who had already served in some ad hoc capacity or another. 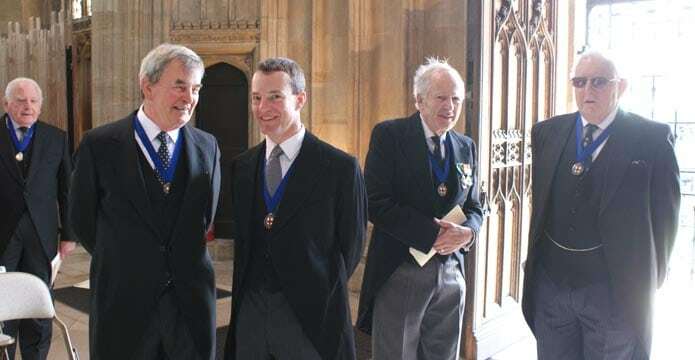 The first Captain was Alec Naylor (the memorial to his long standing Lay Clerk father is in the Dean’s Cloister), the second was Patrick Manley and the third was John Handcock. Since then Tim O’Donovan (Lay Steward since 1978) and Hugo Vickers (Lay Steward since 1970) have served as Captain. To date 86 men and women have been Lay Stewards of St George’s Chapel. The essence of the Lay Stewards role is to provide a Christian welcome to St George’s whether at one of the major Christian festivals, a Royal event or Sunday morning services. The very first duty for the newly formed group was the opening of St George’s House by The Queen in 1966. When on duty Lay Steward’s wear this collar badge. Appointment as a Lay Steward is only by invitation. Evensong on Thursday 6 October will mark the 50th anniversary of the Lay Stewards.